I have a good friend who is getting ready to go out west on a hunting trip. One of the key components to maximizing your efforts toward a trophy is being able to distinguish between a good rack and a great rack at long distances. There is nothing worse than making a several hundred yard stalk and then finally seeing that was not the trophy you had expected. This wasted time hurts when you may have limited time for the hunt and when the chances of getting another kitchen pass validated next year to go out West are slim. When my friend was looking for a good spotting scope, he was willing to make a financial investment for quality and reliability. He ended up purchasing the Leupold Gold Ring HD Spotting Scope Kit for around $1400 plus S&H. The Leupold Gold Ring HD Spotting Scope Kit comes in a durable case as shown below. When you flip the case over, you can see the specifications for the kit attached to the case. During this review, you can click on any photo and it will bring up a higher resolution photo so you can see more detail. When you open the case, all the components of this kit are nicely stored in there respective locations in the case. I'm not exactly sure which ones came in plastic wrappers, but once you take them out, this is what you see. When you take all the components out of the case, this is what is actually inside the case. The information below in italics was taken from the Leupold website and describes their Gold Ring HD Spotting Scope Kit. Unmatched clarity at the highest magnification levels thanks to HD technology. The Index Matched Lens System maximizes maximum brightness, clarity, contrast, and color fidelity. Constant 30mm of eye relief is the longest you’ll find, for comfortable extended viewing. The soft-side, form-fitting case protects your optics, and can stay on the scope during use. Armor coated, rugged, waterproof, and covered by the Leupold Full Lifetime Guarantee. The Leupold Golden Ring 12-40x60mm HD spotting scope offers impeccable optical performance with unmatched resolution and brightness, even at the highest magnification. The compact tripod features adjustable legs and a swivel/tilt head. The Leupold digital camera adapter makes digiscoping easy. Compatible with most digital cameras. Window mount makes in-vehicle use simple. The following photos show the spotting scope from various views to give you a good visual of the outside of the scope. Overall I would say this is a very attractive spotting scope. The textured areas are rubber coated to allow for a good grip. Also, the photos show the eye cup folded back to allow ease of use for those of us who wear glasses. I decided to get a weight of the spotting scope by itself to compare against Leupold's specifications. This scope weighed in at 40.0 ounces. Leupold's specifications says 37.0 ounces. I'm not sure where the difference is, but I'm surprised there is such a difference. I already returned the scope to my friend, otherwise I would have checked the weight of the eye cup, but I doubt it weighs 3 ounces. The next thing I wanted to do was to check out the optics. To be honest, the clarity was a little better looking through the spotting scope directly and not using the camera. In these photos, I had to hold up the camera (adapters didn't fit my lenses) and try to get everything lined up and in focus (the spotting scope and the camera) for the shot. I was impressed with both the clarity and brightness of the scope, which I should be, considering it is Leupold's "top of the line" spotting scope. When using the scope, there are two adjustment rings. The one closest to the eye cup is used to focus the spotting scope. The one with the 12, 20, 30, and 40 marks is the power adjustment rings. Both provide a firm resistance when making an adjustment. I would expect this firmness since Leupold advertises this as a waterproof spotting scope. I'm sure they have a good fit on any o-rings to prevent water from getting in the wrong places. Since this is a Gold Ring HD Spotting Scope, I didn't think the review would be adequate without a closeup photo of the gold ring. As a note, you can also see I need to get some lint free wipes. I don't think anyone should underestimate the importance of this gold ring. Leupold is known for their customer service and the warranties on their products, and I bet if you ever had a problem with this gold ring product, they would take care of the problem quickly. I was a little disappointed when I realized that I would not be able to use the camera adapters to mount my digital camera on the spotting scope. To install the camera mount, you first remove the rubber eye cup. Next you place the Leupold Digital Camera Adapter Base over the eye piece and tighten the clamping knob. The Base Adapter comes with an integral 58mm diameter external thread to adapt directly into a camera lens. The kit also comes with 4 other lens adapters plates for 28mm, 37mm, 43mm and 52mm lenses. The photo below shows the 37mm adapter installed. I was really disappointed when I found that none of my current Minolta/Sony lenses would adapt directly to the spotting scope. Therefore, I couldn't checkout how useful these mounts will be, but I would expect them to be about a billion times better than trying to hand hold a camera and shoot photos through the scope like I did for this review. The Digital Camera Base Adapter weighed in at 2.10 ounces and the adapter plates ranged in weight from 0.85 ounces to 0.60 ounces. Most likely when you take this to the field, you will take the cover and the tripod as shown in the photo below. Leupold did a nice job on the cover. It is designed so that you unzip the eye piece area and fold the two halves back and they Velcro against the side of the cover. Then you flip down the objective cover and it Velcros to the bottom of the cover. It is hard to tell from the photo, but you can also keep the quick release tripod adapter attached to the scope with the cover installed. The cover itself weighed in at 5.20 ounces. This gives you a 45.20 ounce (2.83 pounds) spotting scope including the cover. The tripod adapter plate attaches to the bottom of the spotting scope as shown in the photo below. You actually get two of these adapters. They come standard with the tripod and the window mount. The same adapter will work with either the tripod or window mount. Most likely you will not remove the adapter once you install it on the scope, but if you do, it is very easy. The butterfly like screw is used to attach the adapter to the bottom of the scope. The head of both the tripod and window mount are the same. The tripod adapter tucks under a lip on one side and when you lock it in place, the cam latch automatically closes on the other side making it a firm and secure attachment. The top of the tripod and window mount are adjusted by rotating a locking lever and swiveling the spotting scope into position and then re-locking the lever. You can see the photo on the right below showing the ball that rotates in the housing when unlocked. The tripod can adjust from a range of about 13.5" to 30.75" to the base plate attachment. The tripod legs can telescope in and out as shown above, and they can also be adjusted to three different angles. The photo above on the left represents their first adjustment angle. The two photos below show the other two positions. The tripod weighed in at 36.95 ounces. This means that if you take the scope and tripod to the field, you are probably taking about 82.15 ounces (5.13 pounds). I'm not trying to point out good or bad, just the reality that you add about 5 pounds to your hunting pack. The window mount installs easily on the window and is a nice accessory to have on hand. I think most situations would call for the mobility of the tripod, but I can see there would be times when you may want to scope something from your automobile. It is going to be hard to give an objective "bottom line" because I have not reviewed a bunch of spotting scopes yet. There are spotting scopes on the market today that are less than $100 and some that are over $2000. I'm sure that saying "you get what you pay for" is true for many scopes. I discussed this with a buddy of mine and he has a $100 spotting scope that he purchased on a whim. He was so unimpressed with the optical quality that he didn't even make an effort to take it home from the hunting camp at the end of the season. I think this says volumes on the cheap scope. The two greatest factors you should consider when purchasing a spotting scope is the actual expected usage and how much available cash you have on hand. If your only need is to go to the range and shoot 100 yards, you could probably get by with something in the $200 to $400 range and you will be happy. If you are going to use this for hours at a time trying to identify game on long distance hunts, there is no doubt that the Leupold Gold Ring HD Spotting Scope will be able to perform. The key advantages of this spotting scope are clarity, brightness, and the warranty that Leupold puts on their Gold Ring products. If you are wanting a spotting scope kit to adapt directly to a digital camera, you will need to do your research and make sure your lenses fit the adapters in the kit. If they don't, you will need to get additional adapters. Recently I borrowed a LWRC M6A2 rifle from a friend for a review. You can see the rifle review by going to my LWRC M6A2 Review Summary Page. The rifle had a Horus Vision Talon Scope installed and this review covers this scope. Since I wanted to minimize the disassembly of my friends components, I elected to keep the Buris PEPR mount installed on the Horus Vision Talon scope. This way, when I'm through with my review, I can drop the scope and mount back on the upper rail, torque the rail nuts, and it should be close to his original zero. Also I have already completed a review on the Burris PEPR mount and you can see that at my Burris PEPR Mount Review page. I'm not sure what my friend paid for his scope, but you can find one at Horus Vision Website for $650 plus S&H. When you purchase the scope, it comes in a very plain box. It amazes me that the more you pay for a scope, the less bling you get out of the packaging. This was the same way on a Zeiss Conquest scope I purchased earlier in the year. In contrast, I have been known to purchase some cheap scopes and the packaging on those scopes is extravagant. In the end, a scope should never go back in a package and it is best to put the money where it counts. Since I borrowed the scope for this review, I'm not completely sure if this was all the items in the box. Enclosed were the scope (mount not included), caps, battery, cover and screw driver. I'm not sure about the Owner's Manual, but I feel sure there was one in the box. The online manual shows the H-48 reticle instead of the H-50 reticle. The H-48 reticle is very similar and I think you will understand everything in the manual as it relates to the H-50. In the review, I have included specifications from the Horus website shown in italics and then followed up with my own comments and photos. 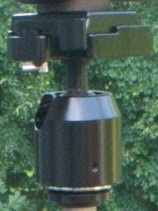 The photo below shows the scope with the Burris PEPR mount still attached. The length checked out to be 9.75" when you screw in the focus ring all the way. With the focus ring set for my eyesight, the length was 9.88". The scope and mount weighed in at 27.05 ounces. 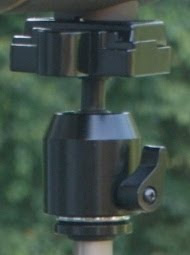 Since I have reviewed this mount in the past, I know the mount weighs 8.48 ounces. That gives a weight of the scope of 18.6 ounces, which is 0.3 ounces heavier than advertised. I don't consider this difference to be significant. They did a nice job with the one piece tube in the way that it swells up for the turrets. Horus states the material as aluminum 6061-T. It appears they have dropped off the correct temper call out such as -T6 which is common for many scopes. You can see the data sheet from Alcoa here for this aluminum alloy. It also appears that they are referring to the hardness on the wrong line and they dropped off some of the data on the hardness test. The hardness indicated is for the aluminum surface after anodizing and is referring to the surface hardness of the part. In my opinion, all they need to do is add the 6 to make it -T6 and drop the hardness call out. The scope has a 1 to 4 power magnification. This is the first scope I have examined that had a 1 power setting and I was impressed with how quickly you can get on target at close range. The power ring has marks at 1, 1.5, 2, 2.5, 3, 3.5 and 4, with a raised index at the 2.5 power setting. The power ring is very firm to adjust. The diopter adjustment ring is also very firm to adjust. My speculation is that there are o-rings inside to allow for the 3 meter water resistance capability. Until now, I have only dealt with scopes that were marked in terms of MOA adjustments, such as 1/4" at 100 yards per click. When I unscrewed the caps and found the "1 CLICK 1/10 MIL", it took me by surprise. I guess that shows I have only purchased sporting scopes in the past. Just so we are all on the same page, 1 MOA is 1 minute of arc (or angle), which is actually 1.047" at 100 yards. Most people round to 1" at 100 yards when talking about MOA. MIL actually came from the military and stands for mil-radian. This is just another unit of angular measurement just like MOA, but it is broken down into radians instead of degrees. 1 MOA is 1/21600th of a circle and 1 MIL is 1/6283th of a circle. So basically, one MIL is 3.44 MOA. The reason for the MIL unit is that this allows for a range finding technique which allows the MIL increments to be used for estimating the range. There will be more on this when I discuss the reticle features further below. You can see a rubber ring at the base of the turret which the turret cap presses against to make a waterproof seal on each turret. To show the reticle, I choose to take the photos against a tan indoor wall. Since the reticle is in the first focal plane, the pattern gets larger as you increase the power. With the reticle being in the first focal plane, the bullet drop compensation features will work for all power settings. The key to success with this type of reticle is to fully understanding the all aspects. Horus has a couple of things to assist with gaining this knowledge. The first is their Owner's Manual and the second is their Tactical Manual. They also have a Demo Shooting Game to help you understand their system. With the scope set at 1 power, the bullet drop compensation features are of little value because you cannot see them. When you crank it up to 4 power, these features do seem usable when viewed against a solid wall. I was very impressed with the illumination of the reticles shown further below. Notice that there is an o-ring at the base of the battery cap to create a waterproof seal. As I adjusted the illumination power, it was not possible for me to see the reticle on the 1 setting in a dark room, and nearly impossible to see the reticle at the 2 setting. The first significant indications with the eye started at the 3 setting. All of the photos above were taken with the illumination at the maximum which is a 11 setting. I would imagine the 1 and 2 setting would be used with some type of night vision system. I was surprised with the brightness of this scope with only a 24mm objective lens. The exit pupil is basically the objective lens diameter divided by the power which is just 24/1 and 24/4 or 24mm and 6mm. Note that a narrow pupil (in bright light) is between 3 to 4 mm and a wide pupil (in dim light) is between 5 to 9 mm (Wikipedia). At 1 power and in low light, your eye will get the maximum amount of light possible. The twilight factor is just a calculation which is the square root of the objective diameter time the power. If you do the math, you come up with the same values as Horus. The real twilight performance for modern scopes come more from the optical coatings. I found the eye relief to be good, but with it being variable in such a wide range, it takes a moment to get the feel. I felt the field of view is adequate for this type of scope. Shockproof to 1200 g should be able to cover any gun that you may want to match up with this scope. Parallax fixed at 100 meters is very standard. It is hard for me to believe that there in only a 1 year limited warranty on this scope. The price and quality of this scope seem to be on par with some other manufacturers who have full lifetime guarantees. The mailbox below was 65 yards away during these photos. I included some of the area outside the scope to give you an idea of the difference in brightness between looking through the scope and the surrounding area. I found this scope to be relatively bright at about 30 minutes before dark when compared to my Zeiss Conquest at a similar power. The single thing I struggle with on this scope is how effective the bullet drop compensation features will be in real situations. Even at 4 power, the photo above shows how hard it is to see the reticle grid pattern when you have a variable contrast background due to grud size. I think you have to keep in mind what Horus intended with this scope. You can get a feel for their intent when you look at the Talon Brochure. Horus says this below in their brochure and I believe it. This scope and reticle are designed for hunting in conditions of contrasting light in brush, wooded areas, grass or steep terrain. Imagine your Talon™ set at 1x. You are prepared for a close encounter of a dangerous kind with a bear. I would consider this an excellent close quarters scope and the aiming circle does a great job of getting you on target fast. I also consider the grid pattern as a bonus and it may be useful one day, but that is probably not the reason for selecting this scope. I liked the brightness and clarity and the overall quality of the product. One last thing I liked was that at any power, the aiming ring is always visible (no battery needed). When you compare the price of this scope against some of the other 1x optics and then start adding magnifiers, this may actually be the better deal.